Working from home is awesome, but it can have its challenges. Thankfully, good habits can make all the difference! I’ve got a great groove going on most days now, but it didn’t happen overnight. Working from home has its challenges, and it’s not always sunshine and rainbows. Being in charge of everything in your day is great, but there are a million distractions at home, and how you choose to approach your work directly impacts your ability to financially support yourself and your family. That can be a lot of pressure! Thankfully, great habits can make all the difference. I have a ton of entrepreneur friends who know a lot about this from their own experience, so I asked them for their favorite ways to stay productive, focused, and balanced when they work from home. These are their tips – in no particular order – along with a few of my other favorites. Find a place that’s as far away from home distractions as you can. You don’t want to get pulled away from work to do dishes, laundry, and clean up kids’ toys! Set office hours and stick with them. This sounds obvious, but how many of you have spent a day working in your pajamas? We’ve all done it! It’s great to be able to work in your most comfortable state, but getting dressed and ready for the day in the morning makes a big difference to your productivity. It reminds you that even though you’re at home, you’re actually working! We can probably get everything done in less time than we usually take, and it’s our choice whether we let it take more time or not. When we have the choice of doing something for two hours, or the same thing for six or eight hours, we can be very motivated to get it all done before lunch! Stay disciplined and say no when it comes to allowing others to plan your day. Having boundaries in place is so important. Turn off the TV and avoid social media when you need to stay focused. If you’re going to check social media, schedule specific times for it and shut it off when it’s not time. This is a great way to stay focused and productive. The goal is to get things done in short, timed bursts that are spaced out by short breaks. This is so simple to do – all you need is a timer. There are also several apps you can use to support you in implementing this method. If you haven’t already, give it a try! It helps you stay focused, productive, motivated, and creative. It can even help improve your attention span and concentration. When it’s time, move away from the computer, and sneak in a little “me time”. This is probably the best habit I’ve adopted. I love to sleep (why is the bed always so comfortable in the morning?) but I’ve always heard that if you want to perform at higher levels it helps to get a really early start to the day. So, this year I finally started doing it consistently, and as soon as I changed my morning routine, my productivity skyrocketed! You can get so much done early in the morning. Then, if the rails come off the day, you’re already mostly covered. Amazing! Nobody likes that shack wacky feeling! 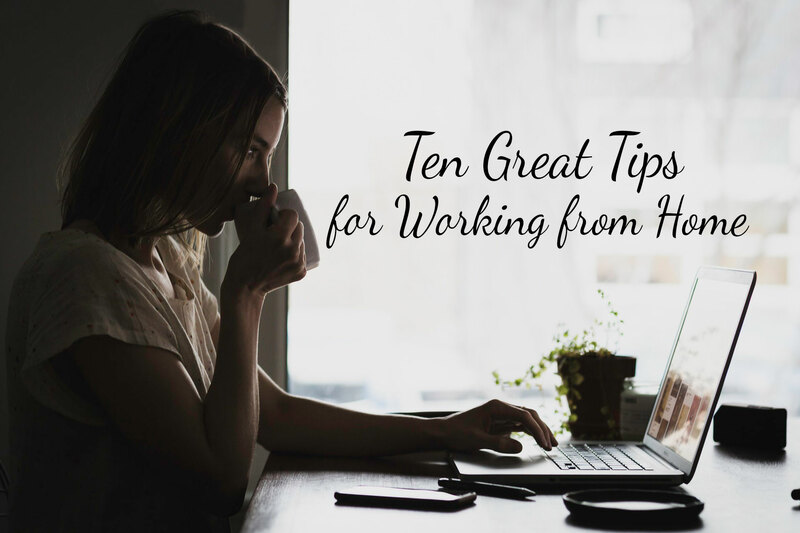 Work outside the home at least once a week to meet people and get a change of scenery. This goes hand in hand with getting up early for me, but you could also do this the night before instead. Write about the important things you want to accomplish during the day, and then schedule them in. Trying to get a million things done in a day is a trap. Pick the top 1-3 things and make them your priority. Schedule your day around the important things you want to accomplish. If using an online calendar doesn’t really keep you on task, try using a day planner instead. This was another big game-changer for me. For some reason, the online calendar just didn’t do it for me, and now I stick to my schedule much better using the day planner. Who else loves listening to music while they’re working? I first started doing this when I worked in a shared work space in a busy office because it was such a great way to block out the distractions. Now it’s almost automatic, I sit down at the computer and my headphones go right in. Listening to music while you work can help keep you focused, happy, and creative. A huge thanks to everyone who shared their ideas with me for this post. I was amazed at the number of responses I got when I put the call out for tips on this subject, and I feel very fortunate to be part of a community of entrepreneurs who are so willing and eager to help each other succeed. What a great reminder that we can and should help and learn from each other! Did you like this post? Subscribe to get them delivered straight to your inbox, and share with your friends!